Rubber Ridge bottom-heels & toe sole front. Buckle detail at front sides and back. Shoes have a rounded toe. Inside, shoes are lined in silver. 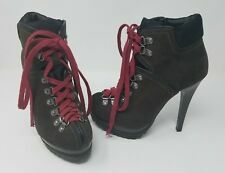 Xhilaration Hiking Boot Look Stiletto Heels. 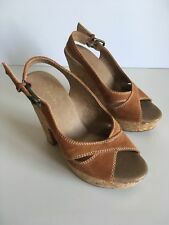 Xhilaration New without Box Brown High Heel Sandals - Size 6. Super cute! the uppers are brown in color and made of all man made materials. the heel of the shoe has the wood look to it and the heel itself is 4" high at the back. the uppers are in great condition and the bottoms have slight wear. Fair Pre-Owned Condition: Previously worn Shoes with minor visible flaw(s) and/or significant wash wear/fade can be considered in Fair condition. How we calculate our Pre Owned shoe size, we use the size chart printed on the shoe if available, if Not we calculate the size using our international size shoe chart mm. We will work out any problems if they should arise. This will ensure you have the fit you desire. Showing slight wear on bottom soles. Add us to your favorites list ! Pre-owned: An item that has been used or worn previously. I do not affiliate with Xhilaration. Cute woman shoes size 6. 4 1/4" HEEL ~~ 1" PLATFORM NARROWING TO 1/2".